Plumes of hot magma from the volcanic hotspot that formed Réunion Island in the Indian Ocean rise from an unusually primitive source deep beneath Earth’s surface, according to new work in Nature from Carnegie’s Bradley Peters, Richard Carlson, and Mary Horan along with James Day of the Scripps Institution of Oceanography. 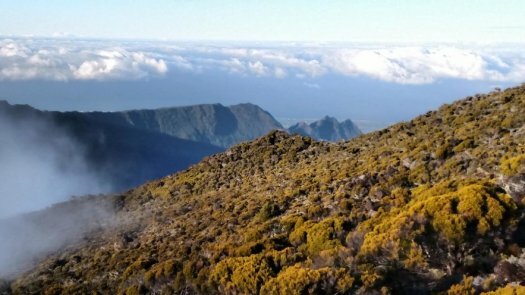 Réunion marks the present-day location of the hotspot that 66 million years ago erupted the Deccan Traps flood basalts, which cover most of India and may have contributed to the extinction of the dinosaurs. Flood basalts and other hotspot lavas are thought to originate from different portions of Earth’s deep interior than most volcanoes at Earth’s surface and studying this material may help scientists understand our home planet’s evolution. The heat from Earth’s formation process caused extensive melting of the planet, leading Earth to separate into two layers when the denser iron metal sank inward toward the center, creating the core and leaving the silicate-rich mantle floating above. Over the subsequent 4.5 billion years of Earth’s evolution, deep portions of the mantle would rise upwards, melt, and then separate once again by density, creating Earth’s crust and changing the chemical composition of Earth’s interior in the process. As crust sinks back into Earth’s interior — a phenomenon that’s occurring today along the boundary of the Pacific Ocean — the slow motion of Earth’s mantle works to stir these materials, along with their distinct chemistry, back into the deep Earth. But not all of the mantle is as well-blended as this process would indicate. Some older patches still exist — like powdery pockets in a poorly mixed bowl of cake batter. Analysis of the chemical compositions of Réunion Island volcanic rocks indicate that their source material is different from other, better-mixed parts of the modern mantle. Using new isotope data, the research team revealed that Réunion lavas originate from regions of the mantle that were isolated from the broader, well-blended mantle. These isolated pockets were formed within the first ten percent of Earth’s history. Isotopes are elements that have the same number of protons, but a different number of neutrons. Sometimes, the number of neutrons present in the nucleus make an isotope unstable; to gain stability, the isotope will release energetic particles in the process of radioactive decay. This process alters its number of protons and neutrons and transforms it into a different element. This new study harnesses this process to provide a fingerprint for the age and history of distinct mantle pockets. Samarium-146 is one such unstable, or radioactive, isotope with a half-life of only 103 million years. It decays to the isotope neodymium-142. Although samarium-146 was present when Earth formed, it became extinct very early in Earth’s infancy, meaning neodymium-142 provides a good record of Earth’s earliest history, but no record of Earth from the period after all the samarium-146 transformed into neodymium-142. Differences in the abundances of neodymium-142 in comparison to other isotopes of neodymium could only have been generated by changes in the chemical composition of the mantle that occurred in the first 500 million years of Earth’s 4.5 billion-year history. The ratio of neodymium-142 to neodymium-144 in Réunion volcanic rocks, together with the results of lab-based mimicry and modeling studies, indicate that despite billions of years of mantle mixing, Réunion plume magma likely originates from a preserved pocket of the mantle that experienced a compositional change caused by large-scale melting of Earth’s earliest mantle. The team’s findings could also help explain the origin of dense regions right at the boundary of the core and mantle called large low shear velocity provinces (LLSVPs) and ultralow velocity zones (ULVZs), reflecting the unusually slow speed of seismic waves as they travel through these regions of the deep mantle. Such regions may be relics of early melting events. “The mantle differentiation event preserved in these hotspot plumes can both teach us about early Earth geochemical processes and explain the mysterious seismic signatures created by these dense deep-mantle zones,” said lead author Peters.